If you’ve been reading my Blog or following me for a while on social media, you’ll know that one of my tried and tested nutrition tips is making protein a priority in your diet. It keeps you fuller for longer, repairs muscle after training and is hugely beneficial in assisting with fat loss. I always recommend making protein a focus at every meal, but what about snacks? Can you hit your macros or fuel up post training without having to carry chicken breasts or boiled eggs around in your gym bag?! Thanks to Sport Nutrition company SCI-MX and their On-The-Go range, then yes you can. SCI-MX products have been created for maximum performance and are endorsed by professional athletes, and with the cookies boasting 23g of protein, and the shakes 22g AND with no added sugar I was curious to give them a try. I tried the Oatmeal and Raisin flavour cookies, but they also come in Double Choc Chip and Strawberry and White Choc. I really liked the taste and the soft, just-baked texture, and I also love the fact they contain glutamine which is my go-to post workout supplement for muscle recovery. At just over 300 calories and 30g carbs however they don’t quite fit my everyday macros for where I’m at with my own personal training goals right now, but for heavy lifters or body builders these would be an excellent gym bag staple. If I have a day of double workouts or am running around constantly from dawn til dusk I would however most certainly turn to one of these cookies – they’re tasty, boast an impressively high amount of protein and are individually packaged so really convenient for my handbag. On a personal level I just couldn’t snack on them every day and stay on track for my current goals. I also tried the Chocolate Pro2Go Milkshake, which I was slightly sceptical about as I’m quite fussy about protein shakes and their taste and texture. I’ve also never been a huge fan of milkshakes so I wasn’t sure if these would work for me….. but I was wrong! They have such a rich, chocolatey taste – but not too sweet and not too chemically (one of my main issues with most commercial protein shakes) and best of all they contain 22g of protein but only 130 calories and less than 1g of fat and carbs. 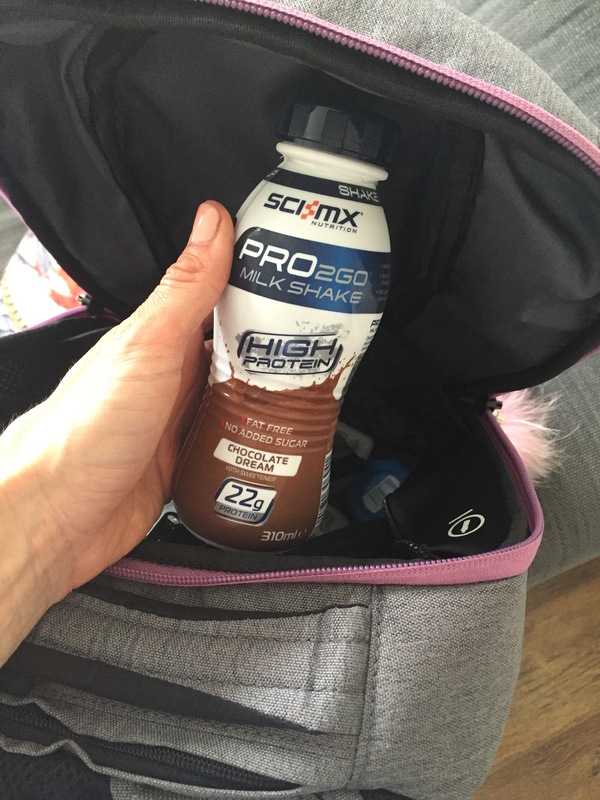 Amazing macros and fantastic post workout fuel – I’ve been having these after teaching Body Pump classes and loving them – they are so easy to carry with me and enjoy straight after a workout. FULL DISCLOSURE – whilst this is NOT a paid or sponsored post, I was given the SCI-MX cookies and milkshakes for free as product review samples. If you try them, then please let me know what you think – I’m definitely keen to give the Strawberry shakes a try now too! The top right hand corner link has my “get in touch” form to contact me directly- thanks!